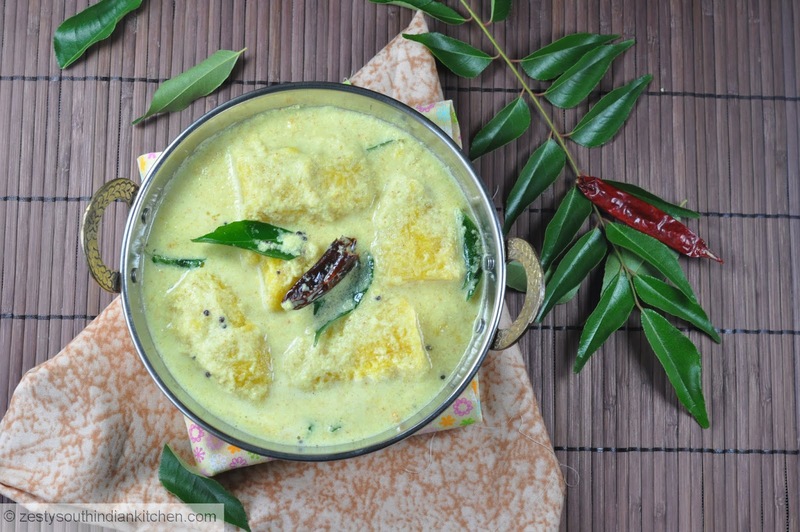 Pulissery is a yogurt based dish, a traditional Kerala cuisine. In India each state has its own version of yogurt based gravies named as kadhi, of which Punjabi, Gurajathi and Rajasahtani are famous in the northern part. As Kerala cuisine is not complete without coconut it is a major ingredient in pulissery, as compared to yogurt based gravies in other parts of India. Amma’s menu always had pulissery at least once a weak. However my hubby is not a big fan of pulissery. If it a fruit based pulissery (mango, ripe plantain) he will run away from the kitchen at fastest speed. So I always cook and eat by myself what else I can ask for. I don’t know why he hates sweetness in curry but at same time like barbeque sauce (is there no sugar there?) I always wonder. Whenever ripe plantain or mango was available my grandma used to makes this curry. She had a special kalchatti (a soap stone pot). Cooking in that pot infuses lot of flavors. Now I miss that pot, my grandma and her tasty dishes. Every week we buy plantains, and most of those will be consumed as ripe plantains either baked or with beaten rice at times. 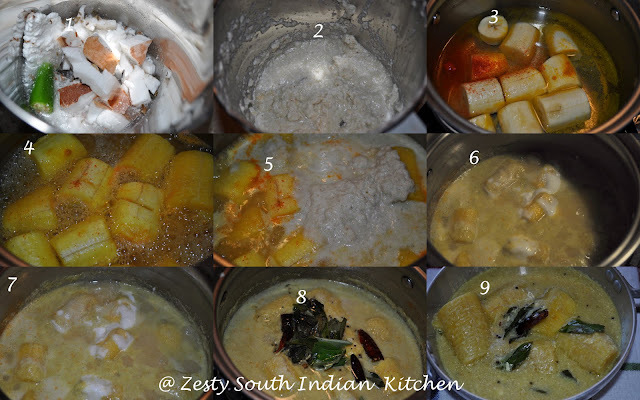 Last Saturday I decide to make this curry as my hubby has some rasam and stir fry. When I asked him, will you take it he told yes I will do but make only a small amount? Then by the end, the episode was same, I have to finish the dish, he didn’t even touch a bit. But he helped with cleaning the dishes, so I was fine with that. He says during weekends I will dump most of the work on him and also he has to take care of the princess. I told him I am taking care of her without any complaint during other days. If I make this curry with vegetables then there will different scene. If you are okay with little bit fruit in your spicy dish then try this, it won’t disappoint you. Coconut, green chili and, cumin seeds are ground into perfection then it is mixed with cooked plantains and little bit chili powder, turmeric and salt. And it gets a final touch of homemade yogurt. This makes ideal companion with bowl of rice and stir-fry. Here goes the recipe. Peel ripe plantain and remove the skin using a sharp knife. Cut plantain into 1 ½ inch pieces. Boil 2 cups water in sauce pot and add cut plantain pieces, turmeric powder, Chili powder and salt and cook them until they become soft not mushy,( it takes about 15 minutes ). One they are cooked remove ¾th of water from the pot and set aside. Mean time grind grated coconut with Green chili and cumin seeds and ¼ cup water to form a fine paste. Add the ground paste into cooked plantain and boil for another 3 minutes or you see small bubbles coming in the top. Lower the flame and beaten yogurt and let simmer for another 2 minutes without letting them boil. Check salt and spices and switch off the flame. In a small pan heat coconut oil and add mustard seeds, red chili halves and curry leaves, once mustard seed starts spluttering remove from the fire and add to cooked plantain pulissery. Enjoy with rice and any side dish. Perfectly looking curry.Hey i tried ur honey wheat bread.I replaced wheat with barley.Thanks for sharing. Pulissery looks delicious, I love mango pulissery but haven’t tasted the one with plantain. Swathi,I am bit confused here.Since ,I have tried twice .The first time ,with all purpose flour& barley and the second time with wheat flour & barley flour.In both the cases ,it didnt raise well.So the conclusion is,if we use barley then we need to use baking soda,instead of using yeast.Will u accept this,or do u have any suggestions.plz let me know. Very different recipe looks yummy!!! Pulissery looks simply irresistible…would love to have some..
Savitha if you want a rise in the bread, then you need swap the ingredients other way, means 1 cup all purpose flour and 1/2 cup barley flour. Barley is hard flour it is not easy for yeast to consume at fast pace. so we need to give them some boost. If you want to use barley flour alone try Rieska which is barley bread of Finland which is flat bread similar to our roti or nan, I haven’t tried though, so don’t know how it taste. This Rieska is made with yeast/baking soda or without any yeast or baking soda. A new dish to me..looks simply delicious! 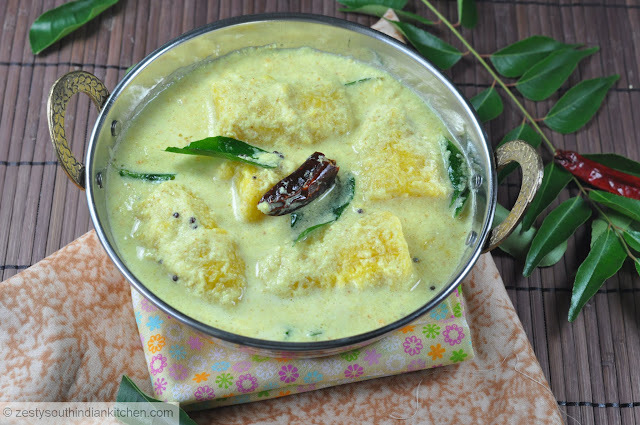 Ripe plantain curry looks delicious Swathi. My favorite with rice,delicious pulissery. Hey Swathi, this is a wonderful idea of making curry with plantains. it never came to my mind to try this curry this way , but now surely will be…thnks ! This is a new recipe for me.I somtimes make curries with raw banana though.Looks yumm and perfect pair with plain rice. pulissery looks really delicious.. lovely pics..
Haven’t had anything like this but looks and sounds delicious. wat a fantastic recipe….absolutely delicious..
That was a wonderful recipe. Great curry. Nice pullisery recipe.I heard about this curry but never tasted.Nice to know about this curry.Awesome pictures. I like how you used yogurt and coconut in the gravy. Two of my favorites! I definitely wouldn’t shy away from a sweet curry! Sounds fantastic Swathi! Wow, a new recipe for plantain! I only fry them or sometimes cook them in the microwave oven. Thanks Swathi, now I have a better way to prepare plantain exquisitely! I can’t wait to try this! Cheers! I love pulisseriies, be it with any fruit, mango, ethappazham or pineapple…This one is yummy yumm..
Oh I am so enamored with this! Plantains AND coconut…it’s like my version of heaven! I see you have made it nedara palam, it has unique taste right can we just use normal banana this is fantastic! I think the taste will be great only with nendra pazham. If that is not available try with pineapple, mango etc. S’s family usually makes this with buttermilk/yogurt…and no plantains – I guess they are too hard to find out here? I asked S if he likes it – and like your husband he says he doesnt either! That banana delight with this sauce so tasty. Looks very tempting and interesting.. I am very sorry for being so late , but life did something that brought me to a stand still! And this sounds absolutely delicious u know , there is so muc i wanna try from ur blog and this one adds to the list.